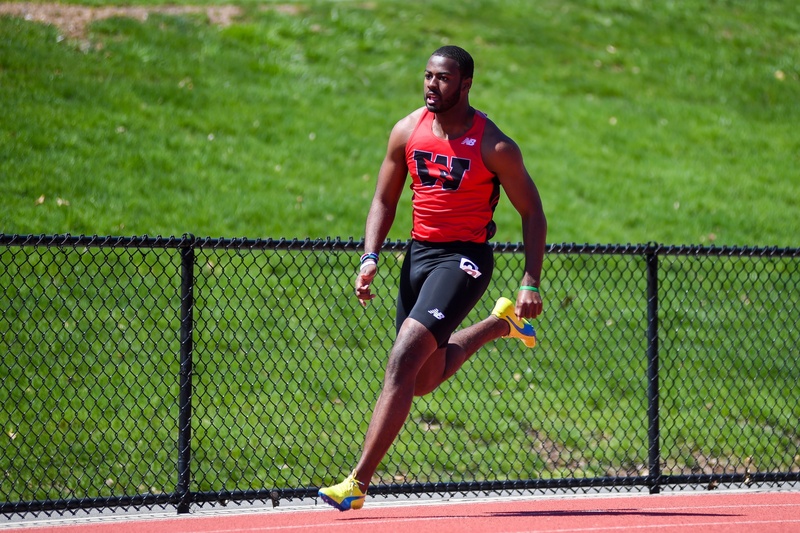 The Wesleyan women’s and men’s track teams sprinted back into action over the past few weeks with two important meets. While most sports teams are wrapping up their seasons, these track and fielders are still running, throwing, and jumping strong with the NCAA Division III Championship meet looming. First up was NESCAC Championship, hosted at ’CAC neighbor Trinity on Saturday, April 28. On the men’s side of the ledger, the Cardinals finished 11th out of the 11 team field. However, a few standouts posted some impressive performances. Kevin DeLoughry ’21 sprinted to a 54.99 second finish in the 400-meter hurdle, good enough for fourth place and a majority of the team’s points. His time also earned him a spot at the New England Championships at the Massachusetts Institute of Technology just five days later. Other top ten performances came from Andrew McCracken ’19 (4.25m) and Jessy Carrasco-Gonzales ’18 (3.95m) in the pole vault. The two standouts respectively finished seventh and tenth overall. On the distance side of the events, Conner Sexton ’20 cruised to a ninth-place finish in the 5000m with a time of 15:21.54. Finally, Grant van Inwegen ’20 placed in tenth in the 1,500m, crossing the finish line in 3:57.72. On the women’s side of the competition, the Birds ran to a ninth-place finish out of eleven teams. Sara Pinsonault ’20 broke her own record in the 3000m with an impressive time of 11:18.51, which was good enough for a fourth-place finish. She was not the only one to shatter a school record on the day. In the 800m, Becky Lopez-Anido ’21 ran a 2:14.32. Along with a place in school history, first year Lopez-Anido’s finish garnered a fifth-place victory for the Red and Black. In the 400m, Jenny Aguiar ’19 crossed the line in 58.07 seconds, earning her a fourth-place finish. In non-running events, Wesleyan was paced by Tara Peng ’20, who leapt to a fourth-place finish in the pole vault (3.25m). In the high jump, Katie Maehl ’19 earned a fifth-place finish (1.54m) and was followed closely by Isobel Wright ’21, who finished in seventh place (1.49m). Next on the season schedule for the two teams was the New England Championship meet at MIT. On the men’s side, DeLoughry narrowly set a school record with a 54.13 second time in the 400-meter hurdles. In addition to a spot in the record books, DeLoughry placed third in a highly competitive field of twenty-two runners in the event. Another first year tallied points for the Cards: Kyron Roberts ’21 dashed to a 50.72 second 400m, earning him twelfth overall. Other impressive performances for the men came in distance events and relays. In the 3000-meter steeplechase, Kevin McMorrow ’20 ran to a 9:38.40, good enough for a sixth-place finish. In the 4×800-meter relay, Bill Bajohr ’20, Sexton, van Inwegen, and McMorrow broke the eight-minute barrier with a remarkable time of 7:58.53, good enough for sixth place. For the women’s team, Pinsonault starred again. She broke her own 3000-meter steeplechase record for the second time this season while setting a new school record three times in total. Her 11:13.40 finish was a personal best by nearly five seconds, and it also earned her second place honors at the prestigious meet. Aguiar was another top finisher, placing third in the 400m with a time of 57.95 seconds. In a unique and challenging event, Katie Maehl performed incredibly in the heptathlon as she scored 4,014 points, earning fourth place overall. Lopez-Anido then added to her string of success with a tenth-place finish in the 800m (2:16.28). Both teams will continue competing at the Open New England Championship next Friday and Saturday at Dartmouth College.